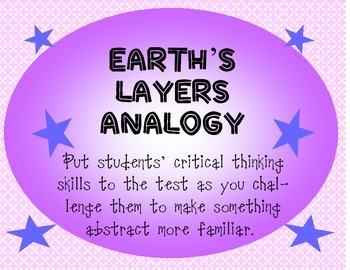 Each student will use a basic understanding of Earth's layers to create an analogy between the layers of the Earth and a familiar object of his/her choice. Often Earth's layers can be confusing for 6th graders because we have never been to the mantle or the core and they seem very far away from where we live. Students often have many misconceptions about the layers, which can be identified easily through this activity. 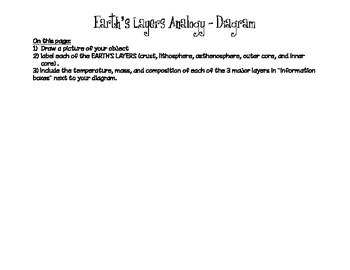 In this activity, students must compare a familiar object and its parts to the Earth and its layers. 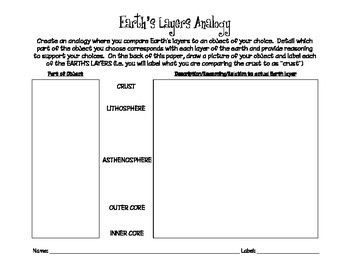 The layers I focus on are: crust, lithosphere, asthenosphere, outer core, and inner core, although this can be simplified to just the 3 main layers for an elementary grades activity or expanded to include additional layers for an extra challenge.